AAA Fire Protection Services specializes in Fire Protection & Fire Suppression for commercial kitchens, processors, restaurants and industrial manufacturing facilities. Our services include: commercial, portable fire extinguishers and fire extinguisher cabinets, sprinkler system design and installations, kitchen fire suppression systems, commercial kitchen grease exhaust system cleaning services, industrial fire protection, grease filter exchange and many other services. We have the highest ratings and we feel that is due to our professional technicians and being up-to-date on the latest technologies for fire safety. In everything we do, AAA Fire Protection Services is deeply committed to the protection of your Santa Clara facility and all of its employees. 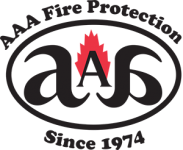 AAA Fire Protection Services is known as Santa Clara’s best provider of fire protection and fire suppression products and services. Our family established our company in 1974 and we are still going strong! We take great pride in being the leader in fire suppression systems and in keeping your employees and your facility safe. Please remember AAA Fire Protection Services the next time you are reviewing your fire safety needs or if your facility is undergoing renovations and upgrading.